“From the moment of conception until death rhythm is as much part of our structure as our bones and flesh” as B. S. Brown wrote in the foreword to the book on “Biological Rhythms in Human and Animal Physiology” by Gay Gaer Luce . In this unique and highly detailed book, the author introduces the scope and influence of many external rhythms and shows that such rhythms underlie “most of what we assume to be constant in ourselves and in the world around us”. Rhythmic variations in body temperature, blood pressure, endurance, metabolic activity and hormone production driven by external variations in temperature, daylight, etc., are observed in humans as well as in animals and plants and at time scales ranging from the 24-h circadian cycle, over monthly rhythms to seasonal and yearly variations. 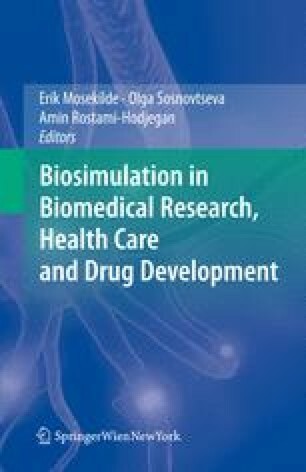 The work presented here could not have been possible without the support of BIOSIM (2005-2010), contract N ∘ SHB-CT-2004-005137. The authors wish to thank Professor Erik Mosekilde, administrator of this network, for his constant support, encouragements and constructive suggestions during the five year project.